The Penthouse offers outstanding panoramic views east towards the city with lift access, as well as secure internal allocated parking and bike storage. This stunning light space is well specced with air conditioning and under floor heating, bespoke kitchen units with granite worktops, and Neff appliances. The en suite bathrooms have been finished with feature marble tiles, and the other bathroom has mosaic and ceramic tiles, all with Duravit fittings. The property is prewired for TV/Satellite and data points. The building has real character and keeps it's original art deco factory feel. Located just across the road from Ravenscourt Park's north eastern entrance gate, it is within the highly desired John Betts primary school catchment though is perfectly situated for numerous good schools both state and private, as well as the shopping and transport hubs of Hammersmith and Westfield. Ravenscourt Park tube station is within a few minutes walk. 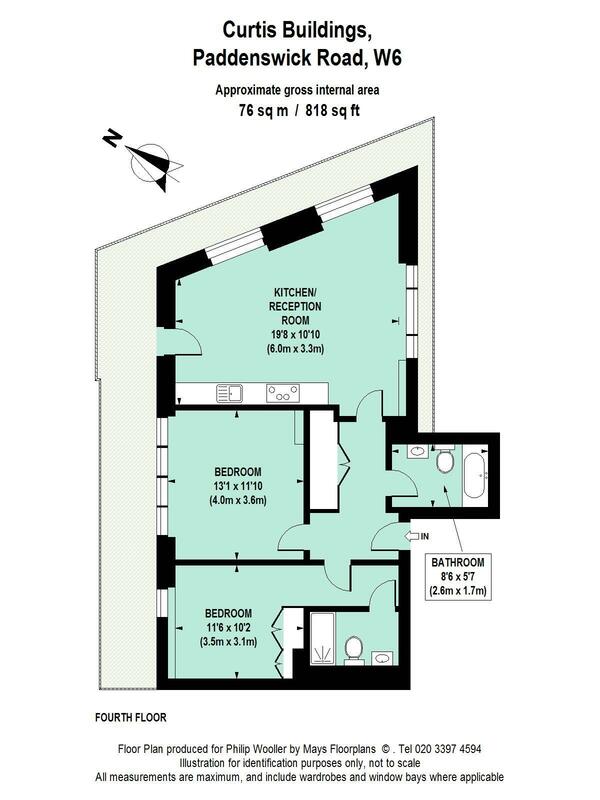 818 sq ft / 76 sq m approx.